First World War commemoration in Europe has been framed as a moment of national trial and as a collective European tragedy. But the ‘Great War for Civilisation’ was more than just a European conflict. It was in fact a global war, a clash of empires that began a process of nationalist agitation against imperial polities and the racisms that underpinned them in Asia, Africa and beyond. Despite the global context of Centenary commemorative activity these events remain framed by national and state imaginaries and ones in which the ideas about nation, race and imperialism that animated and dominated men and women during the Great War sit uncomfortably with modern sensibilities. 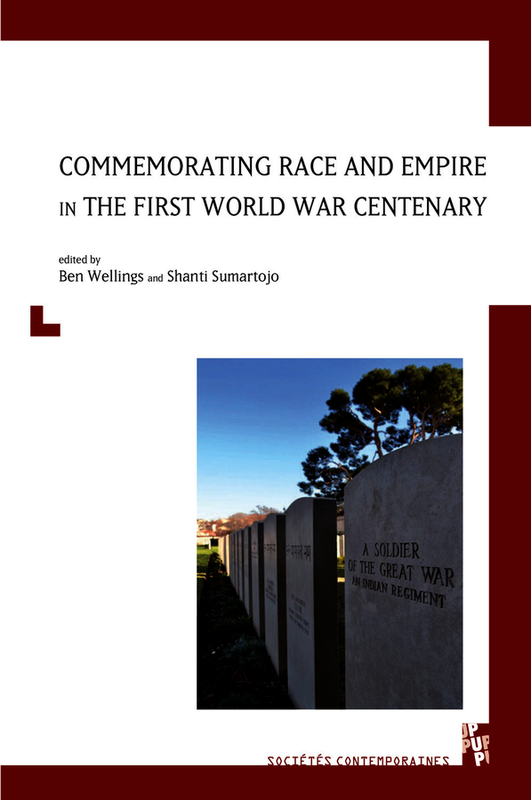 By drawing on original archival research, translations from French and Mandarin into English and by employing multidisciplinary conceptual frames of analysis this exciting and innovative volume explores how race and empire, and racism and imperialism, were commemorated or forgotten during the First World War Centenary. Dr Ben Wellings is Senior Lecturer in Politics and International Relations at Monash University in Melbourne, Australia. Dr Shanti Sumartojo is Vice Chancellor’s Research Fellow at RMIT University in Melbourne, Australia. Together they are co-editors of Nation, Memory and Great War Commemoration: Mobilizing the Past in Europe, Australia and New Zealand (Bern: Peter Lang, 2014). Ben Wellings is Senior Lecturer in Politics and International Relations at Monash University in Melbourne, Australia. He is the author of English Nationalism and Euroscepticism: losing the peace (Bern: Peter Lang, 2012). Along with Shanti Sumartojo he is co-editor of Nation, Memory and Great War Commemoration: mobilizing the past in Europe, Australia and New Zealand (Bern: Peter Lang, 2014). Shanti Sumartojo is a Vice Chancellor’s Research Fellow in the Digital Ethnography Research Centre in the School of Media and Communication at RMIT University in Melbourne, Australia. She is author of Trafalgar Square and the Narration of Britishness, 1900-2012 (2013), and co-editor of Nation, Memory, and Great War Commemoration (2014) and Refiguring Techniques in Digital-Visual Research (2017).